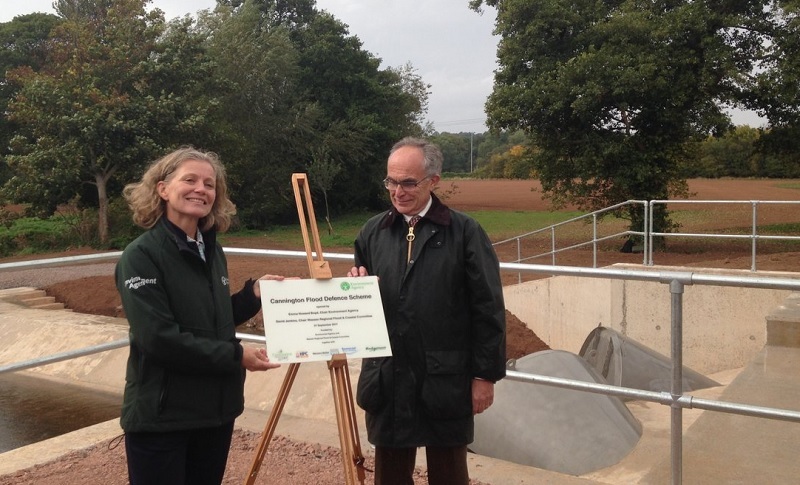 The award-winning Cannington Flood Defence Scheme has been officially opened by the Chair of the Environment Agency, Emma Howard Boyd. The £4.5m scheme has greatly improved the standard of flood protection for around 200 homes and businesses in the village of Cannington in Somerset – which has a long history of flooding from the Cannington Brook. The new flood defences, completed by Team Van Oord on behalf of the Environment Agency, are built to at least a 100-year standard which means there is now only a 1% chance of flooding in any year. “From the recovery after the 2012 flood to the development of this scheme, it’s been great to see Cannington’s community and the Environment Agency working together in partnership. The scheme involved the creation of a new 2km flood alleviation channel after the old brook, built in 1984, was deemed unfit to cope with present and future flood flows. The new channel, which allows for four times the capacity, takes a new route for the first kilometre before entering culverts under the A39 and then following the former channel which rejoins Cannington Brook beyond the village. While the work was carried out, 150 metres of road diversion and a temporary bridge were constructed to allow traffic to continue to use the A39 – the main access road to the Hinckley Point nuclear power station and a busy tourist route taking holiday traffic to the coastal resort of Minehead. The four culverts installed under the road feature ‘hydro-brake’ technology – cone-shaped funnels which accept large volumes of water, swirl it round to reduce speed of flow, before releasing it. During the works, evidence was discovered of people living and working in the area since the late Bronze Age. As a result, land affected by the scheme was fully investigated by archaeologists using a range of techniques including aerial photography, geophysical surveys and hand excavation. Their findings included a ‘ladder settlement’ – a series of rectilinear fields surrounded by ditches (which looks like a ladder). This discovery, along with pottery from the period, indicates a probable Roman settlement. Four graves containing adult skeletons were also discovered, with a shale bracelet found near the wrist of one skeleton. A thriving population of water voles was discovered along the banks of Cannington Brook and surrounding ditches. As water voles are a nationally protected species, efforts were made to protect this local population included relocating them from the site of the works to a new home. As well as protecting the local wildlife, the scheme has provided an amenity area for local residents to enjoy. 31 native tree specimens, along with 160 metres of hedging and more than 5,000m2 of wildflowers have been planted. Bird nesting and bat roosting boxes have also been installed. In September, it was announced that the Cannington scheme has been awarded a 2017 Green Apple Environment Award – an accolade which recognises, rewards and promotes environmental best practice around the world. The scheme has also been shortlisted in the 2017 BIG Biodiversity Challenge Awards.